A particularly beautiful routine features a small silver ball or pearl that is removed from a seashell and takes a life of its own. 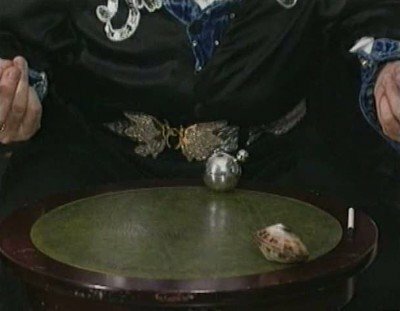 It floats in the air, between your fingers, rides up a small magic wand, travels along the circumference of a large ball bearing and rolls along the back of your hand as it finally floats to you so it can be put back into the shell. You will learn the secrets of Peki's invisible thread that makes it much more invisible than other threads even in close up instances where viewers are only a few inches away from the action. Professionally dubbed into English from German.